April 7, AM Update: This morning's low of 63° is just 1° below both the average high for the date and the record warmest low temperature. A high today of 89° or higher will be enough to push the average for the first week of April 4° above the previous highest in at least the last 80 years. April 6, Midnight Update: With the midnight temperature of 76° higher than last night's reading at the same time by 9°, the record high minimum of 64° for April 7 in 1942 appears to be in a world of hurt. April 6, Evening Update: Today's high was 90°. Dulles set a new record at 93°, beating the 86° in 2005. Baltimore/BWI tied the record of 90°. This is also the earliest date ever to reach 90° at Dulles, breaking the old record of April 16, 2002 by 10 days. It ties the all-time record high for April at Dulles on April 17, 2002. April 6, 5 PM Update: The temperature is 90° as of 5 pm, just 2° short of the record. This pushes the average to at least 66.1°. April 6, 2 PM Update: As of 2 pm, National Airport is reporting a high so far of 88°, which is inconsistent with the temperature on the hour of only 83°. Even assuming 83° for the high, the month-to-date average is now 2° above the previous record. April 6, AM Update: This morning's low of 62° is only 1° below the long-term average high for April 6 and 15° above the original forecast from last Thursday. Martinsburg WV (82°), Richmond VA (89°), Norfolk VA (88°), Raleigh NC (88°), New Bern NC (87°), Binghamton NY (75°) tied their records. April 5, 4 PM Update: At 3 pm, Dulles broke its daily record for April 5 with a temperature of 84°; the old record was 83° in 1985. At 4 pm, it's up 2 more degrees to 86°. Baltimore (BWI) has at least tied its 1942 record of 83°. April 5, PM Update: A wind shift to a more westerly direction (SSW) has popped the 2 pm temperature to 80°. The month-to-date average is now ahead of the 1981 record for the first week of April, with 80s likely again tomorrow and Wednesday. April 5, AM Update: This morning's low was 55°. A high today of 78° or higher will push the month-to-date average above the 1981 record. April 4, PM Update: Low 54°, high 77°, April average to date 62.9° (up 0.9°). April 3, PM Update: Low 49°, high 73°, April average to date 62.0°. April 2, PM Update: Today's high: 77°, average to date: 62.5°. April 2, AM Update: This morning's low: 53°. PM Update: Today's high was 74°, giving an average so far of 60°. Tomorrow's forecast is updated to 80°. Elsewhere in the area, Dulles was 79° and BWI was 73°. After a morning low of 46° this morning, temperatures at mid day have now risen into the mid 60s toward a forecast high of around 75°. Temperatures are expected to warm further to the upper 70s and low 80s into the weekend. As a transition month, April has seen its share of extremes in the Mid Atlantic, so what's the big deal? Sure, the average high for April 1 is only 61°, rising to 64° by the 7th, but the record high for today is 88°, set in 1978, and the record for tomorrow is 89°. The lowest record high in the first week of the month is 85° in 1956, and it was as high as 94° on the 7th in 1929. What's significant here is the persistence of the unusual warmth. 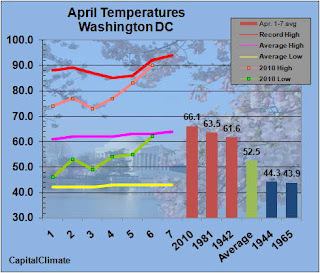 Since records began at the current location of National Airport in 1930, there have been only 3 times that the first week of April averaged warmer than 60°. The warmest was 63.5° in 1981. 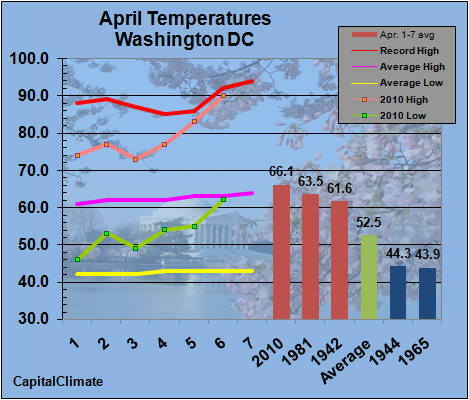 That month as a whole averaged 62.1°, the warmest April in Washington weather records dating back to 1870. Based on the current National Weather Service forecast, the average for April 1-7 this year would exceed 1981 at 63.7°. How cold can it get in the first week of April? It was almost 20° colder in 1965, when April 1-7 overall averaged 43.9°. High temperatures were above 55° only once, reaching 66° on the 5th, and lows reached freezing or below 4 times. Stay tuned as we track this potentially record-breaking week. Below is a list, by state, of all the National Weather Service offices in the coastal regions from Maine to Virginia which normally report occurrences of record events. There are 24 stations in all; 16 of them (67%), indicated in blue, set daily and/or March monthly precipitation records on March 29 or 30. The complete list of records is in the previous post. New York (La Guardia) NA/9.55"
The monthly total of 9.71" at Worcester is the second highest for March since records began in 1892; the record is 11.13" in 1936. Note that rain is still falling in many areas, so some records will need to be revised upward. At 10 pm, Portland had heavy rain with 0.51" in the past hour. Evening Update: At 5 pm, the Boston monthly rainfall total was 14.19". It was still raining moderately at both Boston and Providence. 2 PM Update: At 2 pm, the Providence monthly total reached 15.39", breaking the all-time record. The National Weather Service a few minutes ago posted an update to the record-smashing rainfall pounding Boston and much of the rest of the Northeast. 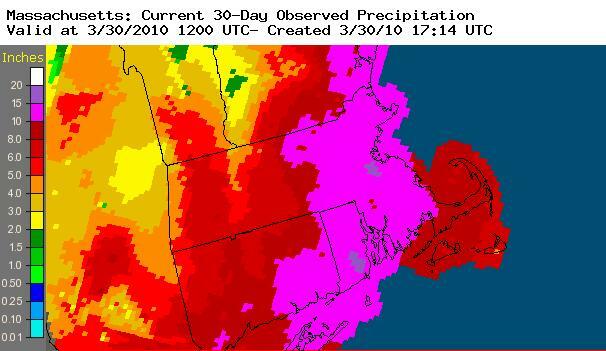 Yesterday's 1.96" of rain at Boston broke the March 29 daily record of 1.85" set in 1984. As of 1 pm, the total so far today is another 1.73". This brings the monthly total to 13.63", a record for March as well as the entire winter/spring cold season. This month's total is now second only to the 17.09" in a tropical-storm drenched August of 1955. The additional 1-2" of rain expected by 6 pm could raise the monthly amount to near 15". As of 2 pm, Boston is reporting heavy rain with an additonal 0.34" in the last hour. Records in Boston extend back to 1872. At the nearby Blue Hill Observatory, the monthly total of 18.12" is approaching the all-time monthly record of 18.78" also set in 1955. The NWS notes that this is now the 3rd episode of excessive rainfall in the region within the last 3 weeks, an unprecedented occurrence in recorded history. 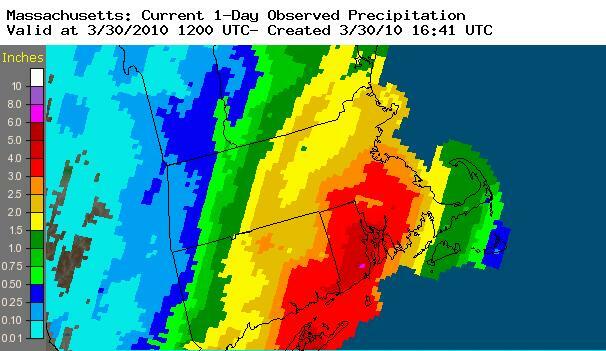 In Providence, RI, yesterday's rainfall total of 3.47" nearly tripled the previous March 29 daily record of 1.19" set in 1931. The 4.31" measured so far today also smashes the old daily record of 2.57". The monthly total so far of 15.31" is just short of the all-time record of 15.38" set in October 2005. What's your definition of "cruel reality"? Maybe getting cancer or losing your legs in a car wreck? But does that term apply to a few days of rain and showers? According to weather forecaster Jason Samenow at the Washington Post's Capital Weather Gang it does. You know, I get tired of weather over-hype. Why do a few springtime showers have to been verbalized as something terribly negative? OK, sure, no one wants it to rain on their wedding day, but a few raindrops on a workday Monday is certainly not something that's even remotely close to being "cruel." Especially not to the plants that can use the moisture. Come on! As noted earlier, the Washington weathercaster revolving door has recently brought Justin Drabick to WRC, Channel 4, as a weekend substitute. Following the appearance of Devon Lucie at WUSA, Channel 9 late last year, Lynnette Charles has been spotted on the station doing the midday report today as a substitute for Howard Bernstein. Charles has formerly appeared on WDEF, Channel 12, in Chattanooga. She is currently listed as a morning meteorologist at WPMT, Fox 43, in York, PA. A bit of moonlighting, perhaps? A report at dcrtv indicates that Charles and Emily Gracey, who previously appeared on WMAR, Channel 2, in Baltimore, have been hired as freelancers while Howard Bernstein recovers from successful back surgery. Bernstein is reported to be aiming for a return to the air next week. WUSA-TV 9NewsNow lied to us. It sneaked in a pre-recorded weather segment with Topper Shutt during the late newscast that followed Friday's NCAA basketball games. What an insult to viewers and ripoff to advertisers. The recorded forecast aired about 12:38am Saturday. The failed atttempt at a seamless transition from the news anchors was awkward and there were no current weather conditions presented. WUSA's obvious effort to hide its little secret shows very poor management judgment and only serves to hurt its image as a trusted source, if it had one. Topper never should have agreed to record a forecast for broadcast and anchors/producers should have objected to being part of it. I hope sponsors that probably never counted on taped weather when they paid big bucks for their ad time raise hell with their account execs on behalf of viewers. If Gannett/WUSA-TV can't afford to pay a live weather talent it should be honest with their customers and audience . A live news anchor should have presented the weather segment instead of attempting this lame deception. Could you blame advertisers and viewers for running to the competition now?